Big data/analytics help organizations harness their data and use it to identify new opportunities. That, in turn, leads to smarter business moves, more efficient operations, higher profits, and happier customers. It also drives process efficiencies and employee productivity, which are primary goals of digital-first initiatives. Qlik is an end-to-end data management and analytics platform which brings together all of an organization’s data from any source. It enables people at any skill level to use their curiosity to uncover new insights. Companies use Qlik to see more deeply into customer behavior, reinvent business processes, discover new revenue streams, and balance risk and reward. Headquartered in Radnor, Pennsylvania, Qlik does business in more than 100 countries with over 48,000 customers around the world. For a decade, TallyMarks Consulting has helped top companies in Pakistan and around the world to fulfill their Business Intelligence needs. We have assisted big names of various industries to understand their data and business processes better using Qlik. We specialize in integrating Business intelligence and Data Warehousing with dynamic self-service applications in addition to standard analysis. From an internal department’s simple dashboard to a corporate-wide analytics system, TallyMarks Consulting can evaluate and fulfill your business requirements with Qlik. Qlik Sense provides “Self Service” analytical approach to data visualization. For instance, it allows end user the ease of creating new interactive and flexible visualizations with just a “drag and drop” method. QlikView provides “Guided Analytics” to dig deep and explore dynamic business-driven data for business discovery. In addition, it has custom app development for any business module with amazing analytics to drive business decisions. Qlik GeoAnalytics moves beyond visualization with built-in support for a broad range of advanced GeoAnalytic use cases. Also, iIt helps to reveal crucial geospatial information and expose hidden geographic relationships. Qlik NPrinting is an “Advanced Reporting and Distribution Solution”. It allows you to create great looking pixel perfect reports from the data in QlikView and Qlik Sense and distribute these reports to users. 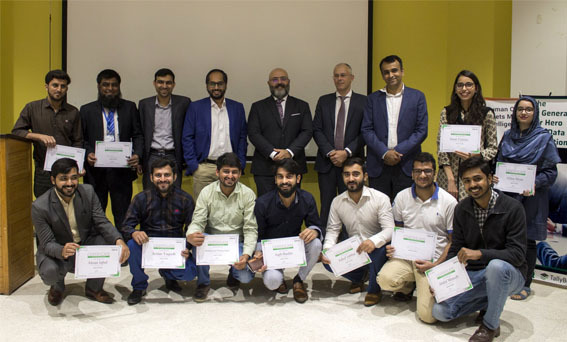 TallyMarks Consulting has taken a step to provide Qlik education to young talent because we want to equip them with the most demanded skill in the world. View the Registration Page for Upcoming Training sessions. Being the Qlik Master Reseller of Pakistan & Afghanistan, we have started a new initiative “Qlik – A Local Perspective” Webinar Series. These are live video tutorials to help our clients and prospects understand Business Intelligence and Analytics in a much better way. Therefore, we have built a good repository of instructional videos. This has made us the authority on in-depth knowledge regarding Qlik in Pakistan.